1Georgia Dermatopathology Associates, Atlanta, Georgia, USA. 2Billie L. Jackson, M.D., LLC, Macon, Georgia, USA. Wstęp: Termin pęcherzowa wysypka polekowa odnosi się klinicznie niepo?ądanych reakcji polekowych, w których występują wypełnione płynem większe (bullae) lub mniejsze pęcherze (blister). Pęcherze mogą być wywołane przez wiele leków, przepisanych na receptę albo bez recepty over-the-counter (OTC), naturalnych lub syntetycznych. Opis przypadku: 78-letnia kobieta została zbadana na obecność szybko pojawiającej się wysypki z rozproszonymi pęcherzami ró?nej wielkości i obrzęku brzucha. Metody: Wykonano biopsję skóry z barwieniem hematoksyliną i eozyną, jak równie? immunofluorescencję bezpośrednią i analizę immunohistochemiczną. Wyniki: Barwienie H & E wykazało zaburzenia- subepidermalne pęcherze. W skórze właściwej obserwowano, o łagodnym przebiegu, powierzchowną, okołonaczyniową infiltrację limfocytów, eozynofili i histiocytów. Nie prawdziwe leukocytoklastyczne zapalenie naczyń było mile widziane. Immunofluorescencja ujawniła silną obecność Complement/C3, IgM i fibrynogenu w górnych warstwach skórnych naczyń krwionośnych. Barwienie z LAT, MUM-1 i ZAP-70 było zidentyfikowane w zapaleniu naczyń, jako delikatny wzór soli i pieprzu. Wnioski: W pęcherzowych wysypkach polekowych, zapalenie naczyń krwionośnych skóry bez prawdziwej leuckocytoclazji było często zauwa?alne; zmiany naczyniowe na spodzie pęcherza są często opisywane jako niespecyficzne. Udokumentowaliśmy swoiste markery aktywacji limfocytów T odpowiedzi immunologicznej; dalsze wtórne ogniwo cząsteczek sygnałowych szlaku są w nadmiernej ekspresji w naczyniach krwionośnych skóry, co wskazuje na zło?oną odpowiedź odpornościową u tej pacjentki. Bullous drug reactions (BDRs) may occur secondary to various medications, both prescribed and over-the-counter, and natural or synthetic. Blistering may be clinically localized and mild, or widespread and severe. Blisters may be the major feature of the reaction; alternatively, blisters may be seen focally, or in localized areas of a more extensive rash. The reaction may show features of more than one condition (overlap) or be clinically unclassifiable. BDRs represent one of the most common blistering disorders encountered in dermatopathology, being more prevalent than the classic nosologic autoimmune cutaneous blistering diseases. 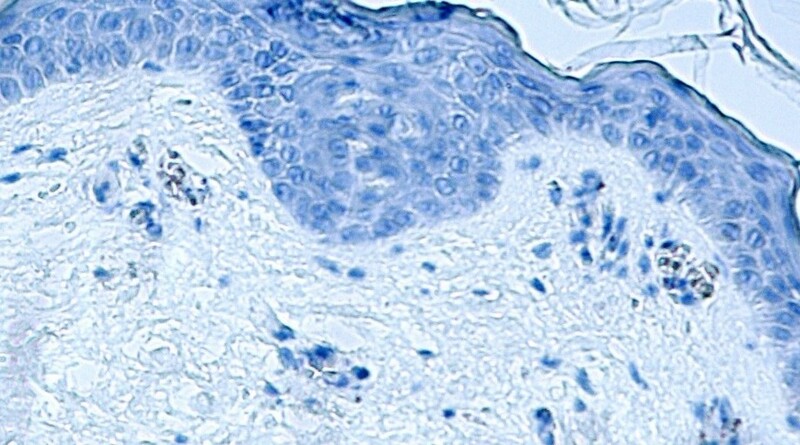 Hematoxylin and eosin staining as well as direct immunofluorescence (DIF) of the skin, often demonstrate findings that can be shared by several diseases, thus being of limited help in establishing a definitive diagnosis. The typical histologic differential diagnosis includes 1) a bullous allergic drug reaction, 2) bullous pemphigoid, or 3) a bullous arthropod bite reaction. 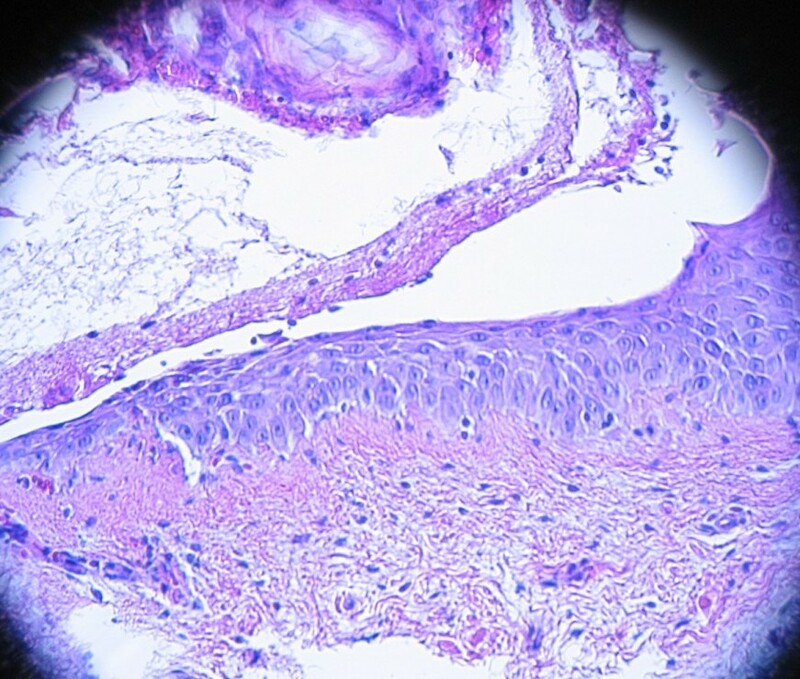 Indirect immunofluorescence (IIF)/salt split skin studies may be helpful in further distinguishing between these diagnostic possibilities, if clinically indicated. We obtained skin biopsies for hematoxylin and eosin (H&E) staining, for direct immunofluorescence (DIF), for indirect immunofluorescence (IIF) with salt split skin studies and for immunohistochemistry (IHC). A 78-year-old female was evaluated for 2 day duration of blisters on the abdomen that were mild to moderately painful. The patient was taking docusate, diltiazem, KCl, furosemide, omeprazole, ranitidine, pravachol and acetaminophen. On physical examination, the abdomen displayed one intact bulla that was tense, and showed mild erythema at the base. A second, adjacent site on the abdomen was consistent with a ruptured bulla with a denuded surface. There was no significant crusting to suggest pemphigus vulgaris. The face, chest and neck showed no involvement. The patient had an allergy to Codeine. 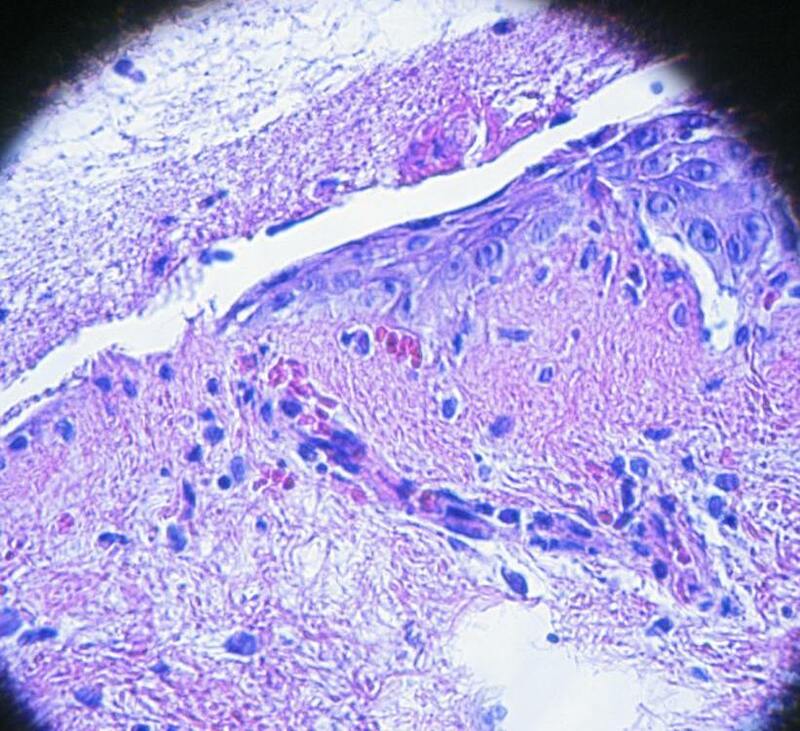 A lesional skin biopsy was taken for hematoxylin and eosin (H&E) analysis. 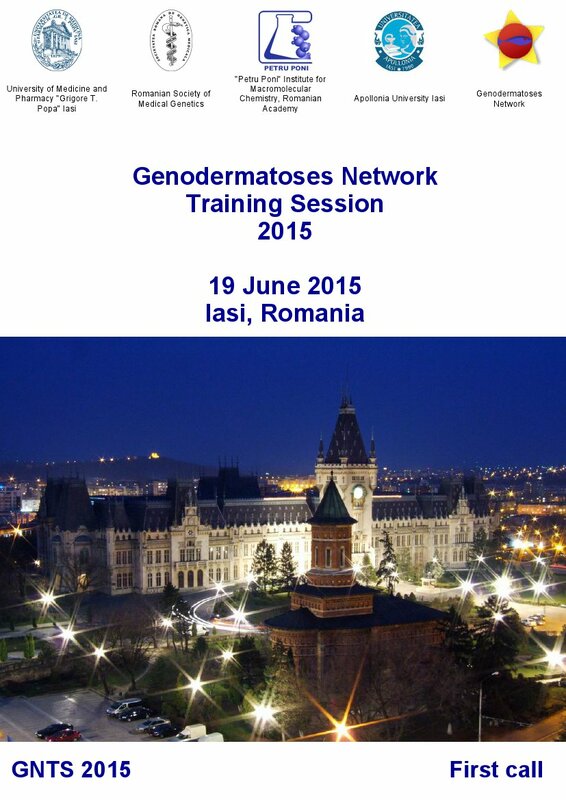 In addition, direct and indirect immunofluorescence (DIF, IIF) and immunohistochemistry (IHC) studies were performed. DIF and IIF/salt split skin were performed as previously described. Skin cryosections were prepared, and incubated with multiple fluorochromes, as previously reported [1-4]. IHC: Performed as previously described, including antibodies against the linker of activated T cells (LAT protein), Zeta-chain-associated protein kinase 70 (ZAP- 70) and MUM-1(multiple myeloma oncogene-1) protein [2-4]. Results Microscopic description. H&E examination demonstrated a subepidermal blistering disorder. Partial blister re-epithelialization was noted. Within the blister lumen, eosinophils were present, with occasional neutrophils and lymphocytes. Mast cells were rare. 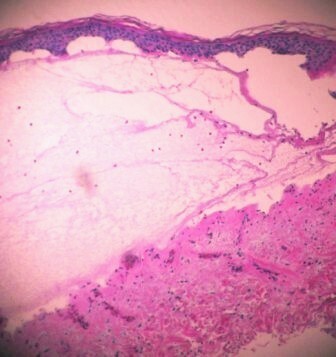 Within the dermis, a mild, superficial, perivascular infiltrate of lymphocytes, histiocytes and eosinophils was seen. Direct immunofluorescence (DIF) studies were performed; results were classified as 4+ (very strong positvity) to (-) negative. 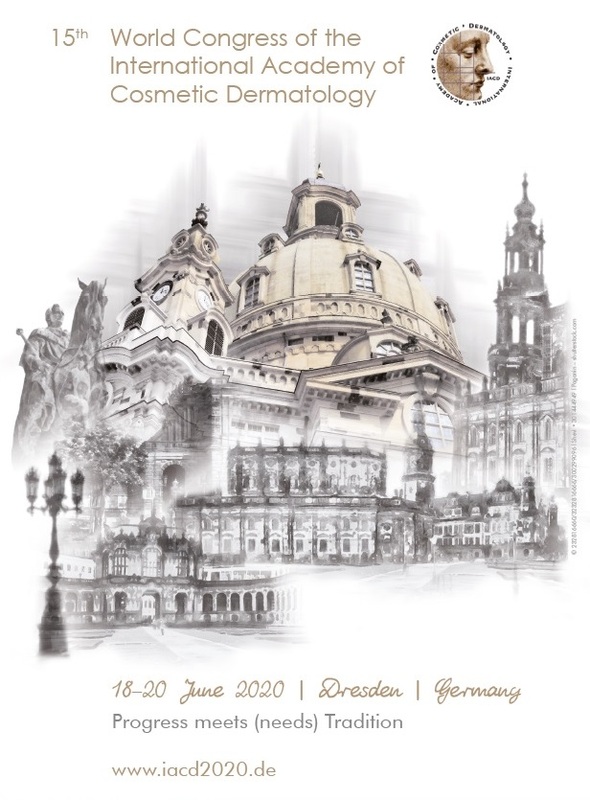 Case results were as follows: IgG(+, focally positive BMZ); IgG3(-); IgG4(-); IgA(-); IgM (++, at superficial upper dermal vessels); IgD(-); IgE(-); Complement/C1q(-); Complement/C3 (++), positive around the upper dermal vessels; albumin(-) and fibrinogen (++), positive around the upper dermal blood vessels and inside the subepidermal blister. Antibodies to human plasminogen were negative (Fig. 1). 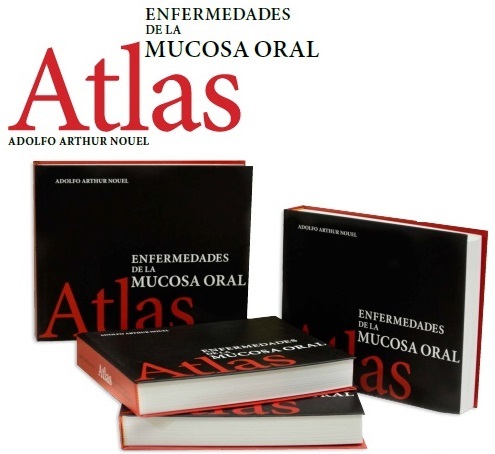 Bullous drug eruptions are often diagnosed clinically, i.e., by careful history and physical examination. However, in many cases, these reactions can mimic other diseases [2,4]. The H&E skin biopsy may help to make the correct diagnosis, but does not usually help in establishing whether the reaction is druginduced. The presence of a vasculitis-like reaction is often noted, not fulfilling the diagnostic criteria of a leukocytoclastic vasculitis.[4-7]. Although we were not able to appreciate a true leukocytoclastic vasculitis, the case DIF clearly indicated an immune response against dermal blood vessels when utilizing FITC conjugated anti-human fibrinogen and complement/C3. 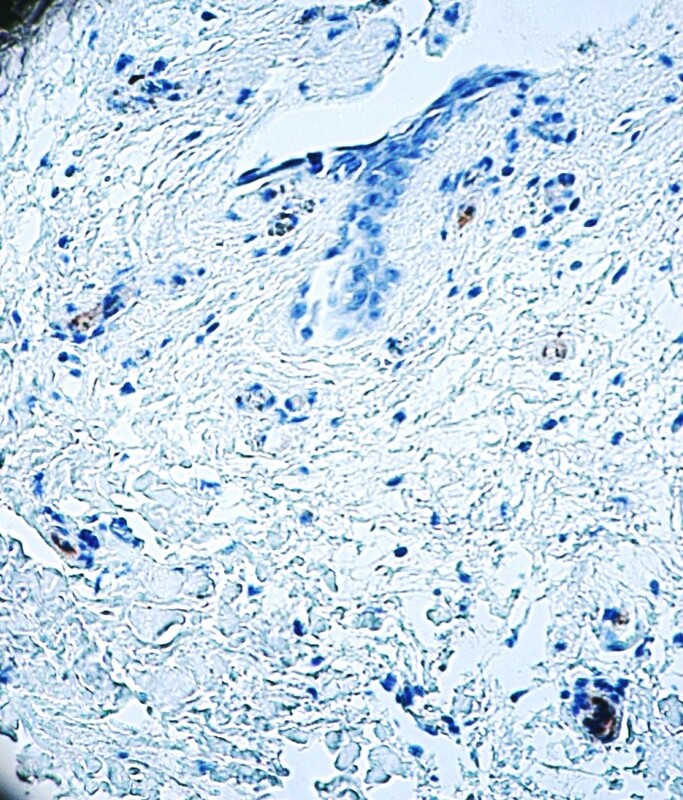 Further, by IHC we were able to appreciate staining with antibodies against ZAP-70, LAT and MUM-1 proteins. The protein encoded by the LAT gene is phosphorylated by ZAP- 70/SYK protein tyrosine kinases, following activation of the T-cell antigen receptor (TCR) signal transduction pathway . The LAT transmembrane protein localizes to lipid rafts (also known as glycosphingolipid-enriched microdomains or GEMs), and acts as a docking site for SH2 domain-containing proteins . Upon phosphorylation, this protein recruits multiple adaptor proteins and downstream signaling molecules into multimolecular signaling complexes located near the site of TCR engagement . ZAP-70 is normally expressed in T cells and natural killer cells and has a critical role in the initiation of T-cell signaling . ZAP-70 is a member in the protein-tyrosine kinase family. T lymphocytes are activated by engagement of the T cell receptor with processed antigen fragments presented by professional antigen presenting cells (e.g. macrophages, dendritic cells and B cells) . Upon this activation, the tyrosine kinase Lck becomes activated, and phosphorylates the intracellular portions of the CD3 complex (called ITAMs). The most important member of the CD3 family is CD3-zeta, to which ZAP-70 binds . MUM-1 is a 50 kDa protein encoded by the MUM-1 gene . The MUM-1 molecule also has other monikers, including 1) interferon regulatory factor 4 (IRF4) and 2) interferon consensus sequence binding protein for activated T cells (ICSAT). MUM-1 has been associated with melanocytic cells, and is involved in the DNA damage response pathway by contributing to the maintenance of chromatin architecture. Recruited to the vicinity of DNA breaks by TP53BP1, it plays an accessory role in facilitating damage-induced chromatin changes and promoting chromatin relaxation. MUM-1 is required for efficient DNA repair and cell survival following DNA damage . We conclude that in this case of a bullous allergic drug eruption, we observed some degree of inflammation of the dermal vessels without frank leukocytoclastic changes. We have described specific activation markers, especially of the T cell immune response; and further, overexpression of secondary cell signaling pathway molecules in dermal blood vessels, indicating a complex immune response in this patient. Figure 1. a-c. H&E shows a subepidermal blister (upper blue arrow) with a positive inflammatory infiltrate of the upper epidermal vessels (lower blue and maroon arrows). 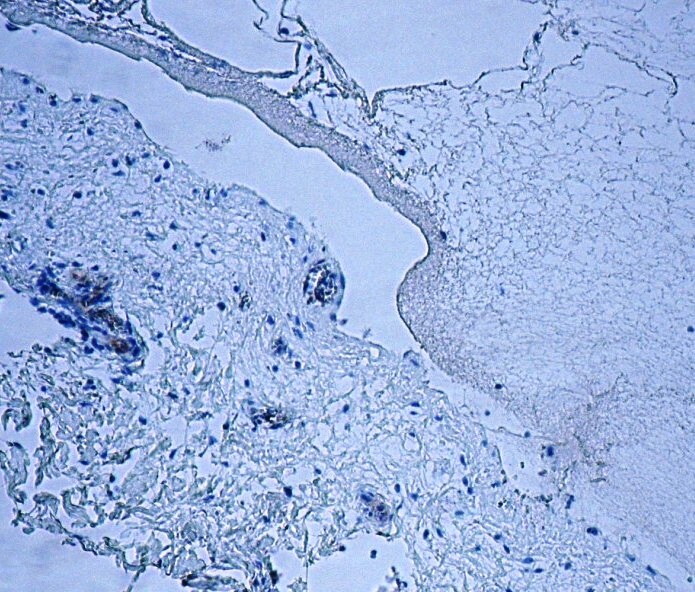 Positive staining of the blister containing FITC conjugated fibrinogen (white arrow). The blister lumen is shown by yellow stars. 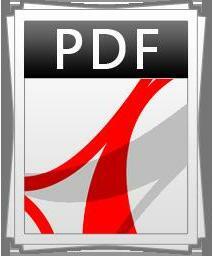 d, f. DIF. 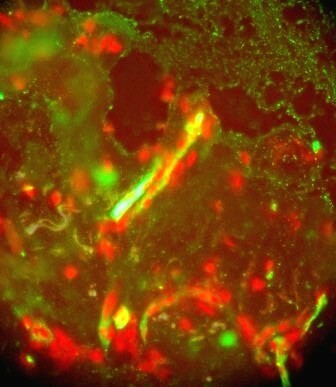 d. Positive staining of the upper dermal blood vessels with FITC conjugated anti-human C3(green staining; white arrows). The nuclei of the cells were counterstained with Topro III (red staining). Blister lumen is indicated by yellow star. f. FITC conjugated anti-human-IgM positive staining of the upper dermal vessels (green staining, white arrows). 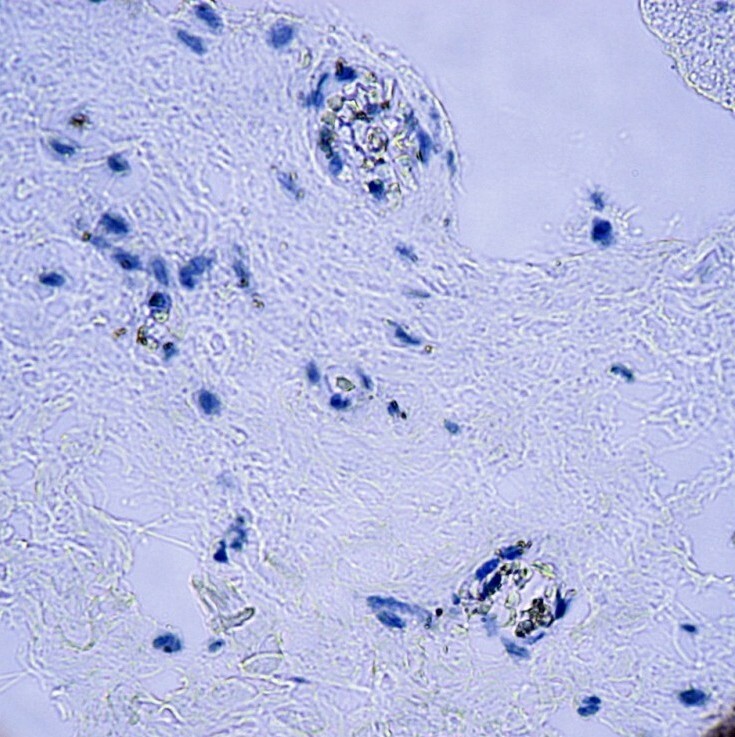 anti-human-IgM positive stain of the upper dermal vessels. The nuclei of the cells were counterstained with Topro III (red staining). Blister lumen is indicated by yellow star. e, g, h, i. IHC. e. Positive staining with MUM-1 in the small vessels under the blister (brown staining; red arrows). Blister lumen is indicated by yellow star. g. Positive staining with LAT in the same small vessels as MUM-1, under the blister (brown staining; red arrows). h. Positive staining with ZAP-70 in the same small vessels as MUM 1 and LAT, under the blister (brown staining; red arrows). Blister lumen is indicated by yellow star. i. Positive staining with HLA-DPDQDR in upper dermal inflamed vessels under the blister (brown staining; red arrows). Blister lumen is indicated by yellow star. 1. Ghohestani RF, Nicolas JF, Rouselle P, Claudy AL: Diagnostic value of indirect immunofluorescence on sodium chloride-split skin in the differential diagnosis of subepidermal autoimmune blistering dermatoses. Arch Dermatol 1997; 133: 1102-1107. 2. Abreu Velez AM, Jackson BL, Howard MS: Deposition of immunoreactants in a cutaneous allergic drug reaction. North Am J Med Sci . 2009; 1: 180-183. 3. Abreu-Velez AM, Smith JG Jr., Howard MS: IgG/IgE bullous pemphigoid with CD45 lymphocytic reactivity to dermal blood vessels, nerves and eccrine sweat glands. North Am J Med Sci 2010; 2: 538-541. 4. Abreu-Velez, AM, Klein AD III, Howard MS: Junctional adhesion molecule overexpression in Kaposi varicelliform eruption skin lesions -as a possible herpes virus entry site. North Am J Med Sci 2010; 2: 433-437. 5. Cotliar J: Approach to the patient with a suspected drug eruption. Semin. Cutan. Med. Surg. 2007; 26: 147-154 6. Carr DR, Houshmand E, Heffernan MP:. Approach to the acute, generalized, blistering patient. Semin. Cutan. Med. Surg. 2007; 26: 139-146. 7. Roujeau JC: Clinical heterogeneity of drug hypersensitivity. Toxicology 2005; 209: 123–129. 8. Zhang W, Sloan-Lancaster J, Kitchen J, Trible RP, Samelson LE: LAT: the ZAP-70 tyrosine kinase substrate that links T cell receptor to cellular activation. 1998. Cell. 92; 1: 83–92. 9. Chan AC, Iwashima M, Turck CW, Weiss A:. ZAP-70: a 70 kd protein-tyrosine kinase that associates with the TCR zeta chain. Cell. 1992. 71: 649–662. 10. Natkunam Y, Warnke RA, Montgomery K, Falini B, van de Rijn M: Analysis of MUM1/IRF4 protein expression using tissue microarrays and immunohistochemistry. Mod Pathol 2001; 14: 686-694.